I was talking to Hanes online just now. He mentioned that I dun talk a lot about my own relationship with God with him a lot. Hmm... maybe that's true. Maybe instead of getting my sheep to share their life with me, I also need to share mine with them also. Good to know that God still loves me. They reenacted this video in the Christmas eve service. I never failed to get amazed by this video. It's after Christmas and now approaching the new year. 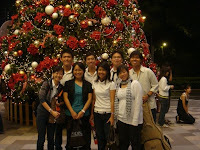 We just had a splendid Christmas service at The Rock and our first uni-YA service at KYMC. The cg saw a new convert and a few more to come, in faith, in the next coming weeks. I was looking back at my own spiritual journey for the past two years. Why two years? Because my journey as a spiritual leader physically began then. I was asked today what was my feelings when I rose up as a leader in the group. Today I end my exam and therefore, my second last semester at the exam classroom is coming to an end. Reaching this point, it tends to give me a sense of nostalgia in this classroom, especially my own corner. Life has become more bearable after that lonely night with Bowen and more people began to join us since that day, though we ran into some problems and received a bit of scare. But it just makes me look back and think about my time that I have spent here in this classroom. I started out here in my year 1 days. I wasn't a believer and we just arrived in the classrooms to study. I also blur blur follow the people around, since I didn't really have any place to study. But it became the place where I will witness Christ in everybody's life, especially the part where I see people praying for one another. That's what I saw and that's what I eventually come to believe in: Christ.